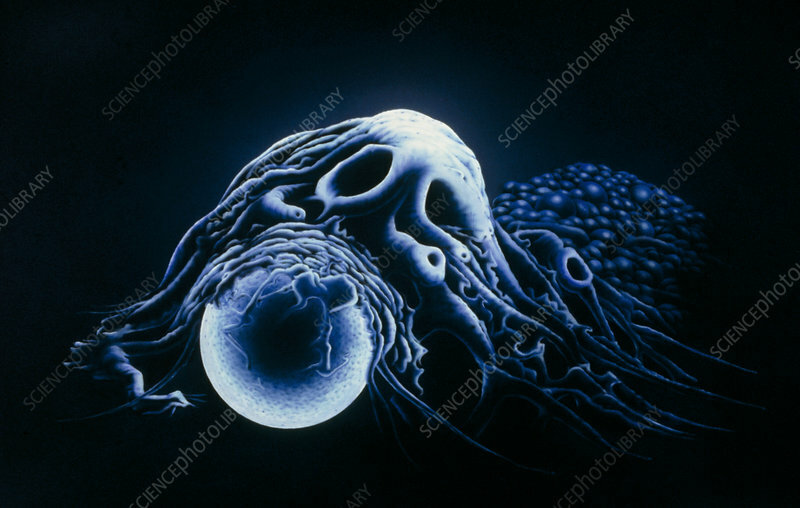 Illustration based on a scanning electron micrograph of a human macrophage phagocytosing (engulfing) a latex bead. Macrophages are monocytes from circulating blood that have migrated to tissues, notably in lymphatic system & lungs; certain types migrate to sites of infection in response to chemical stimuli. In addition to a scavenging role, the macrophage is capable of processing antigenic (foreign) substances during initial phase of immune response. Processed antigens are presented on the macrophage's surface so they might be recognized and possibly ultimately eliminated by specific lymphocytes.